Everyone who has lived in snow knows it is not as white as it looks - it's rarely white at all. Mixed in with the reflective flakes are tiny, dark particles of pollution. University of Washington scientists recently published the first large-scale survey of impurities in North American snow to see whether they might absorb enough sunlight to speed melt rates and influence climate. The results, published in the Journal of Geophysical Research, show that North American snow away from cities is similar to Arctic snow in many places, with more pollution in the U.S. Great Plains. They also show that agricultural practices, not just smokestacks and tailpipes, may have a big impact on snow purity. During their almost 10,000-mile trek across North American snowfields, the researchers were particularly interested in the Bakken oil fields of northwest North Dakota. "With all this oil exploration, diesel trucks and new oil wells, people wondered: Is there a huge amount of air pollution making the snowpack darker?" said lead author Sarah Doherty, a research scientist at the UW's Joint Institute for the Study of the Atmosphere and Ocean. What they found was that these activities do appear to be adding extra soot to the snow, but perhaps just as important is the dirt. Disturbance from clearing oil pads, new housing sites and all the extra truck traffic on unpaved roads means dirtier snow. But even away from the oil fields, soil is disturbed by agriculture. "Our work suggests that land use and farming practices might matter as much as diesel emissions in many parts of the Great Plains," Doherty said. Doherty was part of a team of UW atmospheric scientists who spent the winter of 2013 driving across northwestern U.S. states and some Canadian provinces to get a firsthand look at the continent's snow. Their main focus was black carbon, a very light-absorbing particle emitted by burning diesel, coal or wood. Many countries have regulated black carbon because of its effects on air quality and human health, but more recently climate scientists also have become interested because the tiny particles darken the snow and hasten melting. 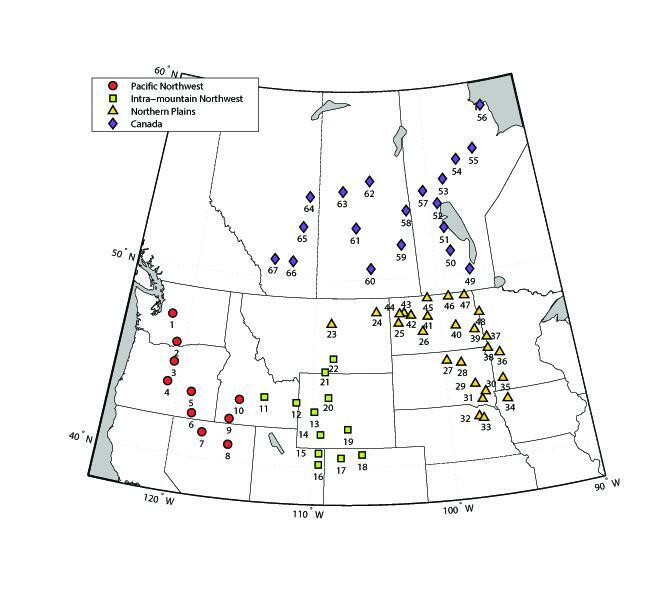 The cleanest samples they collected were from northern Canada, with overall levels of black carbon, or soot, similar to that of Arctic snowpack. The Pacific Northwest and Rocky Mountain states had levels slightly higher. The Great Plains readings were more variable and sometimes two to three or more times higher than in other parts of the country, typically 15 to 70 nanograms of soot per gram of snow. Doherty previously worked with co-author Stephen Warren, a UW emeritus professor of atmospheric sciences, on a 2006-2010 survey he led of snow in the Arctic. Warren and Doherty also worked with Chinese collaborators in 2010 surveys of snow in northern China, all using the same techniques so the combined results can provide a first-ever global map of snow cleanliness. "For a lot of the central U.S. and north China Great Plains the snow is not very deep. In the U.S., almost the whole area is agricultural fields and in China there is a lot of animal grazing," Doherty said. "When the wind blows the dirt gets lofted, maybe just 10 feet off the ground, and gets mixed in with the snow." North Dakota locals refer to the mixture as "snirt." The new paper documents how much light is blocked, and at which wavelengths, by filtered snow samples. Other co-authors and snow collectors were research professor Dean Hegg and graduate students Cheng Dang and Rudong Zhang, all in UW atmospheric sciences. A companion paper by Dang and Hegg involved a chemical analysis of the North American samples to pinpoint exactly which compounds are contained in the snow. "A lot of the focus in climate models has been on black carbon, because it's a pollutant and it's very dark," Doherty said. "But the snow is darkened by other things as well, like organics, and also by dust and soil that can get in the snowpack." In fact, they found that in the Great Plains states up to half of light absorption is due to organic matter, or "brown carbon" from burning fossil fuels and from soil that mixes in with falling snow. The deposits affect both global and local climates. Pollution on the Himalayan glaciers, for instance, is raising concerns that it will speed melt rates and harm water supplies. For U.S. farmers, changes in the snow's reflectivity could affect when the spring melt will occur and when meltwater will drain out. Whether the pollution the researchers found in North Dakota is enough to change snow melt timing will have to be answered by region-specific climate models, Doherty said. "But first the models have to do a more accurate job of representing the amount of dirt that's in the snowpack," she added. The work was funded by the Environmental Protection Agency and the China Scholarship Fund.